Children from Whakamarama School listen intently to Bay of Plenty Regional Council Environmental Scientist Rochelle Carter during stream activities. 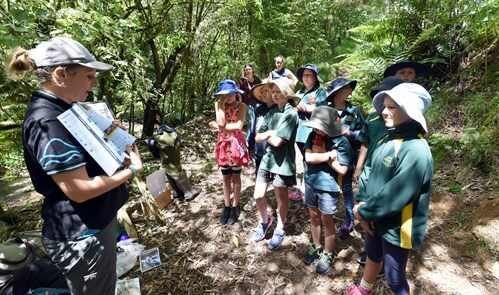 More than one hundred students from 10 Bay of Plenty schools enjoyed a day out discovering how to monitor and care for their local waterways yesterday. Another eighty students from eight more schools are doing the same today. The 8-12 year olds are participants in an annual Hands-on Water Expo, hosted at Redwood Valley Farm in Paengaroa by Bay of Plenty Regional Council. “Looking after waterways is everyone’s business. The kids that joined us today have had fun, while learning what aquatic insects, eels and pest fish look like, discovering what the main causes of flooding, water pollution and how to control them are, and gaining the skills to measure things like stream flow, clarity, and rainfall,” said event co-ordinator and Bay of Plenty Regional Community Engagement Advisor Natalie Ridler. “The participants come as representatives from their schools and will go home and share what they’ve learnt with their classmates, families and wider communities. We’ve been running the event for several years now. 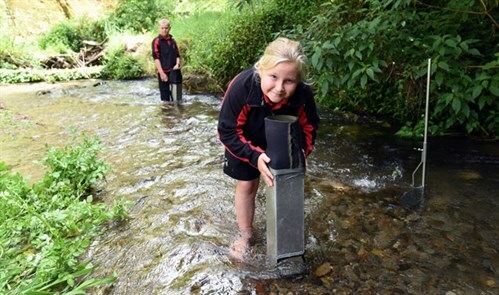 We usually see a few schools inspired to set up monitoring and stream care projects in their local waterways afterwards, which is a fantastic outcome,” Ms Ridler said. Examples include the Ngākau Māhaki class at Te Puke Primary who set up a care group to help look after the Ohineangaanga Stream last year, and St Thomas More Catholic School in Mt Maunganui who have been monitoring a Tauranga Harbour estuary site at Matapihi since 2015. Bay of Plenty Regional Council has co-ordinated the Hands on Water Expo which is being delivered in partnership with NZ Landcare Trust, Department of Conservation, Western Bay of Plenty District Council, Tauranga City Council, Emergency Management Bay of Plenty, Maketū Ongatoro Wetland Society, and Hemi O’Callaghan who each run one of eleven activity stations that the children rotate through in the course of the day. “We’re really grateful to our event partners as well as the teachers and parent helpers that make the Expo possible. Yesterday’s students had a great time and we know they’ll be fabulous water ambassadors as a result. We’re looking forward to doing it again in years to come,” said Ms Ridler. The Harbourmaster Team gave children the chance to practice letting off their own flares. Council Harbourmaster Peter Buell and the Harbourmaster Team made their first appearance at the Expo this year. Mr Buell said the event was a great opportunity – right at the start of summer - to teach children about boating safety when out on the lakes. 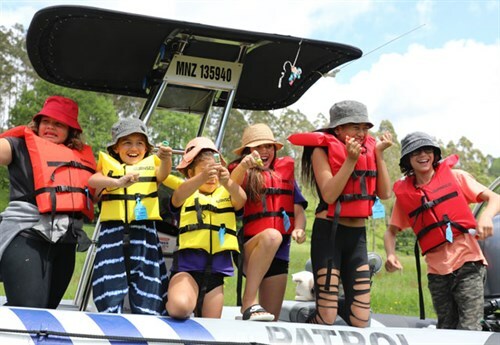 “We focused on the importance of wearing a lifejacket and demonstrated how badly things can go wrong if a properly fitted life jacket is not worn,” Mr Buell said.